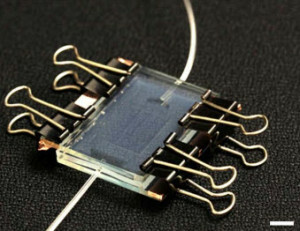 A prototype of the leaf-inspired solar cell. Right corner: 1cm scale bar. As solar cells, and obviously the solar energy sector in consequence, become ever more popular spurred by increased demand through out the world, scientists today are currently interested in two major keypoints: increasing efficiency – the most important and immediate goal at hand – and making solar cells as cheap as possible without, obviously, compromising quality (solar conversion efficiency). Solar cells made out of organic material have been studied for a while in hopes of addressing the latter keypoint, as these could be manufactured a lot cheaper while also being more environmentally friendly than silicon-based counterparts, currently the de facto used in the industry. Organic solar cells come with a major drawback though. They deteriorate really fast due to ultraviolet ray stress, which has prompted many to deem them unfeasible. 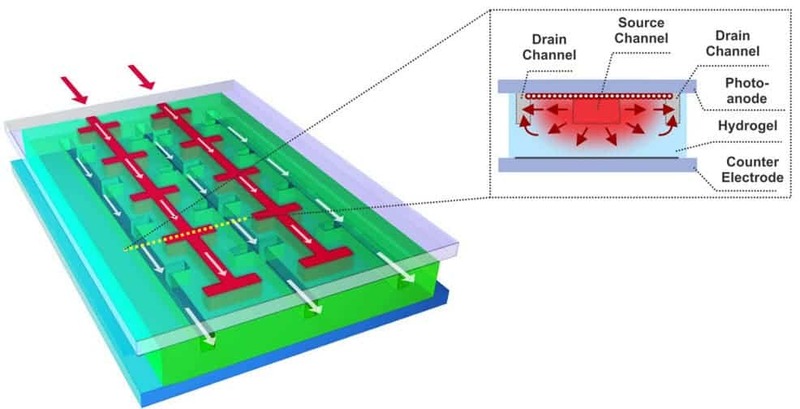 Now Orlin Velev and Hyung-Jun Koo, two researchers at North Carolina State University, show that there’s a way around this after they designed an innovative system that constantly replenishes the solar collecting organic material, inspired by the branching vascular channels that circulate life-sustaining nutrients in leaves and human hands. The nature-mimicking or biomimetic devices that they designed are classed as dye-sensitized solar cells (DSSCs) since light is captured and converted into electricity by light-sensitive organic-dye molecules. These are very inexpensive to produce and supply, and are circulated along microchannels. The DSSCs were reported in the journal Scientific Reports. It’s worth mentioning some other biomimetic solar cells that are currently being employed, but whose design process and working principle take an alternate root. These are typically referred to as “artificial leaf” solar cell systems, and as you might guess work by mimicking as closely as possible plant photosynthesis. These systems produce hydrogen fuel, which can be used to power anything even electrical generators, only out of water and light. They’re still pretty far from becoming reliable, but we’re getting there.